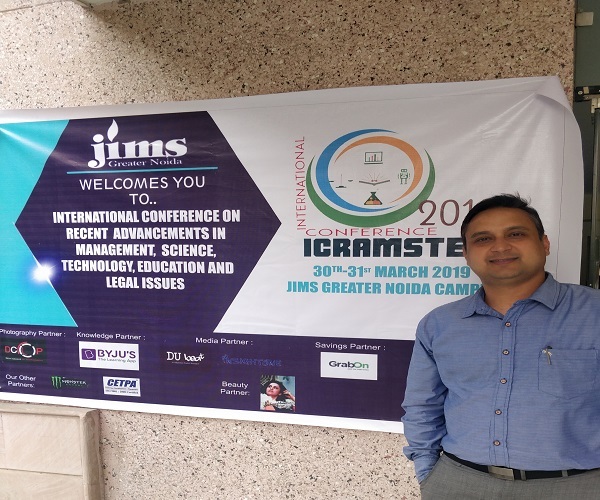 Dr. Surendra Tiwari , Faculty of Department of Management at I.T.S Ghaziabad attended International Conference at JEMTECH as session chair. Conference was intended to take stock of recent advances and development of knowledge bases and easy access to structured databases on systems, processes and technology based on quantitative study trends and developments at the globally competitive environment that will provide future directions to young researchers and practitioners. Objective of conference was to help in sharing of experience and exchange of ideas, which will also foster National Collaboration. 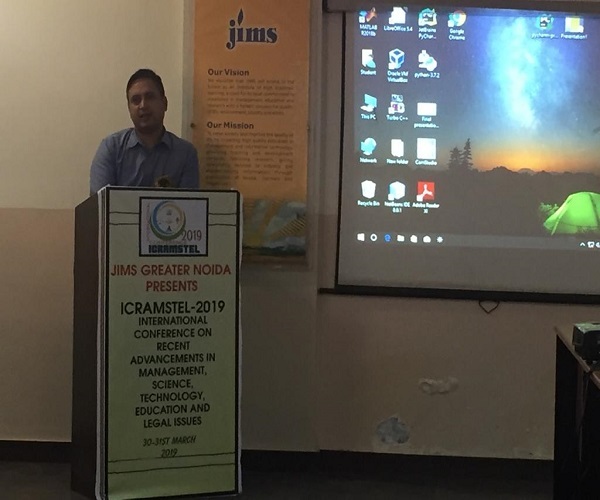 The Conference was of immense benefit to Researchers, Academicians, Industry and Participants from Technical Institutes, R&D organizations, Management & Legal Practicing organizations and students working in the field of Engineering, Management, Law and Education. 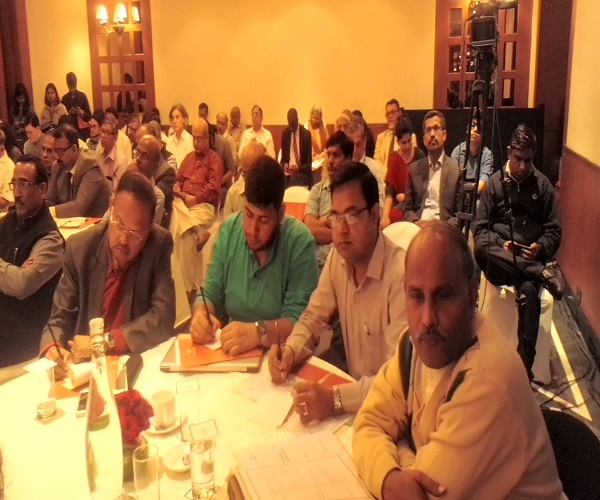 Conference witnessed large number of academicians and professionals in the allied fields along with their papers. 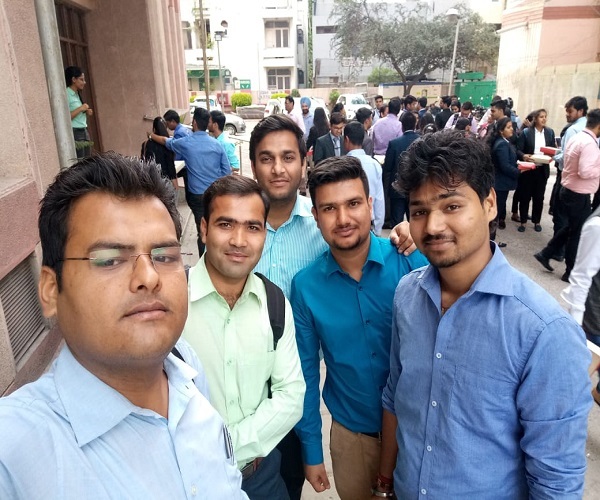 Department of Management at I.T.S Ghaziabad organized a webinar session on "Make it Personal: Lessons from IBM on Reinventing Performance Management" by MIT Sloan Management Review, in collaboration with McKinsey and Company on 29th March, 2019. Speakers for the day were Miss Diane Gherson, Chief Human Resources officer at IBM, Miss Anna Tavis, Clinical Associate Professor of Human Capital Management and Academic Director of the Human Capital Management Program at New York University and Mr. Bryan Hancock, a partner at McKinsey & Company, based in Washington, D.C., and Global Leader of McKinsey’s Client Service on Talent. Miss Allison Ryder, senior project editor at MIT Sloan Management Review was the moderator of the session. The session started with Ms. Rydergiving an overview of performance management at IBM. Discussions then continued about the forces of change in the digital area in Human Resource which includes personalised and digitized HR, continuous learning, the culture of feedback and transparency and lastly agile ways of working and leading. The participants also focussed on the trust agenda, noting how it had changed in recent times. There was also a brief discussion on performance management at IBM, along with the checkpoints on the journey, including key points likeDesign Thinking, Creation with Employees and Active Participation. The New Agenda for Talent Management was the highlight of the session. Points were discussed and comparisons made about the transition from “Trust Me” To “Show Me”, from doing things to the employees to doing things with the employees, etc. The webinar came to an end by addressing the audience questions online. About twenty students from the PGDM programme attended the webinar along with the faculty members. At the end of the session, the students were debriefed by the faculty present. PG Management Sports Club "STATESMAN" at I.T.S Ghaziabad organized one day Sports Activity “Sportacus” on 29th March 2019. 120 participants participated in various events. Events scheduled for the day were VOLLEY BALL, SHOE LACE RACE, DODGE BALL and TUG OF WAR. 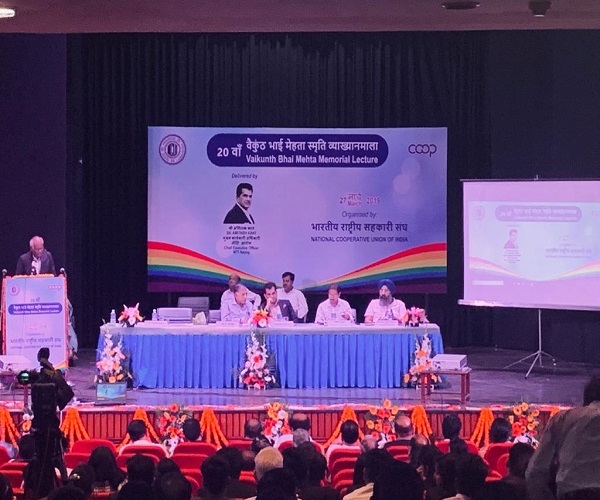 The event started at 10:00 a.m. with the inaugural session in the presence of Director (Management Dr. Ajay Kumar, Faculty coordinator Dr. D. K. Pandey, Dr.V.N. Bajpai, Dr. Sanjeev, Sports officer Mr. R. S. Chawala & students. Volley ball was a successful event of the day as there were 4 teams participating. Each team gave a tough fight to each other. The final match was a thrilling one and the winners were Japneet and Team. Runner up was Ayush and team. Shoelace Race started with huge enthusiasm and cheer from audience. The competition offered a fun friendly sporting environment. There were 11 teams each consisted of 2 players. 6 teams made it into the finals. Winners were Trique & Avnish and Runner up were Rajeev & Subhajyoti Pal. Dodge ball was an entertaining event for the audience when it was started crowd was full of cheers for the players where each team were having 6 players. 4 teams participated in this event, every team was allotted with 5 minutes and in that span of time they had to dismiss as many players as possible. Winner was Rajeev and team and Runner up was Japneet and team. Tug of war was the most awaited event and it was our last event 8 teams participated each team consisted of 6 players. The final was a nail biting won but Manjeev and team outplayed everyone. The event came to an end at 5:30 p.m. with prize distribution ceremony felicitated by Director (Management) and faculty members. This was a successful and a grand event, it was witnessed by huge participation and enjoyed by all the students. Department of Management organized a wonderful Alumni interaction with PG management students. 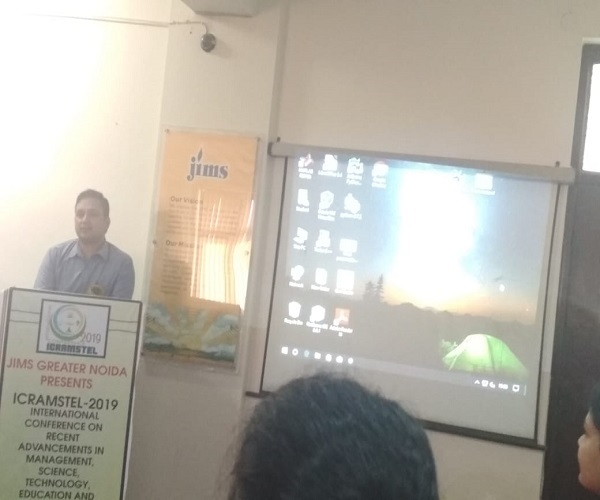 Mr. Gopal Tiwari, an alumnus of PGDM (2006-08) batch, currently associated with the leading Pharmaceutical company, Cipla and his colleague Mr. Kushagra Srivastava, Area Business Manager (Agra Region), Cipla interacted with the students of MBA and PGDM programme on 29th March, 2019. “Sustainability in Jobs: A Big Question?” was the topic for discussion. Dr. Ajay Kumar, Director (Management) extended a floral welcome to Mr. Gopal and Mr. Kushagra. Dr. V N Bajpai introduced both the guests. Prof. Durba Roy shared many memories about Mr. Gopal when he was a student at Institute. Mr. Gopal shared his journey at Cipla from Marketing Representative to Regional manager and challenges he faced during this time period of 10 years. He motivated students to be always ready to take up new initiatives and challenges in professional career. Based on his experience, the key success factors for sustainability in jobs are Dedication, Dynamism and creative thinking. He said that Life is a marathon, not a sprint. One should have consistency and long term focus. Building a good career is about making the decision to run a marathon and then preparing, running, recovering and repeating the process several times over. He answered several questions raised by students covering various aspects of personal and professional career ahead. It was a great learning experience for participating students. 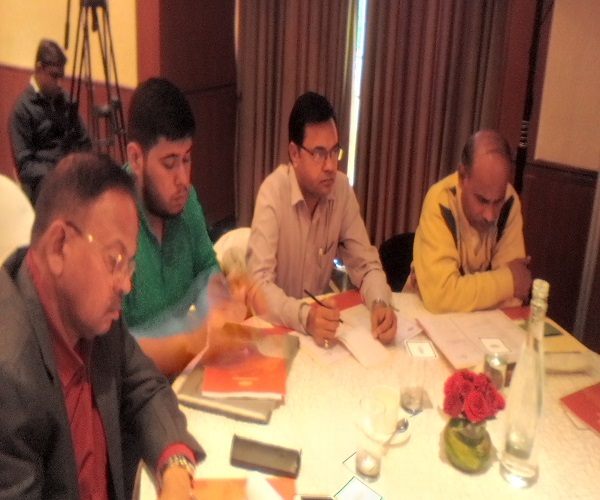 Dr. D K Pandey, Dr. Anusha Agrawal & Dr. Nitin Saxena were also present during the session. 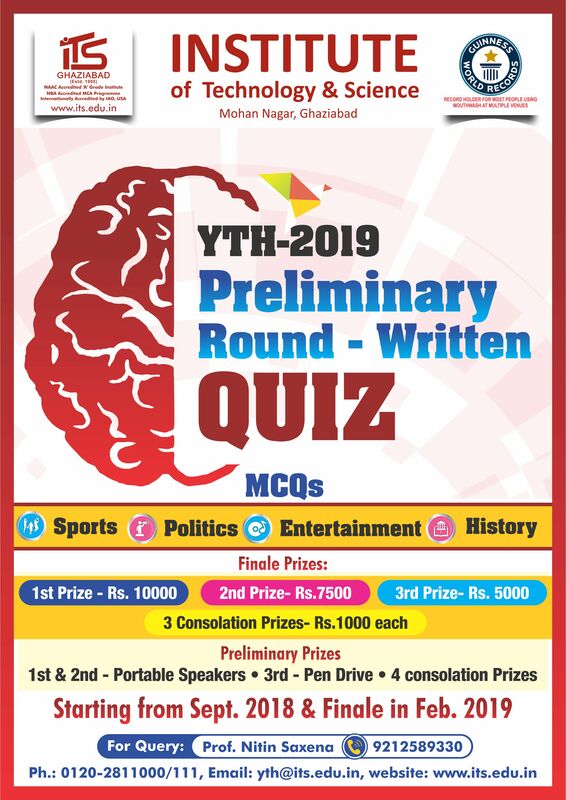 Faculty Coordinators and Student volunteers taught the importance of the Internet and different search engines followed by a quiz competition based on Historical Monuments. In the first segment of the activity, students were taken to Computer Labs to learn working on internet. Participants were taught to use “Google Chrome”. Student Volunteers taught them to use Internet and gathering information. Then they were asked to prepare a Presentation on the theme for the day. In the second segment of the activity, students presented their views on Historical Monuments of India. Also, children were introduced to some fun games that made them learn to be creative and confident. Director (Management), Dr. Ajay Kumar, Dr. Nitin Saxena and Prof Shilpi Vaish - Faculty Coordinator of Utthan Club, along with team felicitated the event by distributing Prizes to all the winners of the activity. All the students were given refreshment at the end of the session. Department of Management at I.T.S Ghaziabad organized a felicitation ceremony for the volunteers in Parivartan and Uthaan, the two CSR activities of I.T.S Mohan Nagar. The ceremony opened with introductory remarks by Prof. Lokesh Upreti, Coordinator - Parivartan. This was followed by the address by Director (Management) Prof. (Dr) Ajay Kumar, where he impressed on the students why it was important to involve themselves in such kind of selfless service, where they are unlikely to receive any tangible benefits. He also expressed the hope that all the students would continue to be associated with this type of social service long after they have left the college. After this the certificates were handed over to the outgoing volunteers of the 2017-19 batch by the Director sir. Certificate Distribution ceremony was followed by cake cutting ceremony and all enjoyed snacks and cold drinks. It was a time for solemn remembrance of activities performed through the year, while also pledging to continue on the same path in the future. 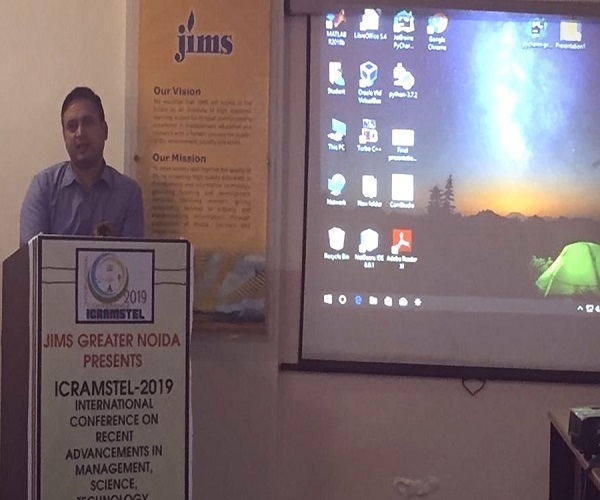 Department of Management at I.T.S Mohan Nagar Ghaziabad organized a webcast on “Are you still evaluating performance?” for faculty members on 27th March, 2019. Eminent speakers for the session were Mr. Anupam Kaura, President, Human Resources, CRISIL Limited and Mr. Raghu Pantfrom SAP SuccessFactors Value Engineering practice, India. Session started with a very interesting round of questions for the participants focused on mapping their perception about the utilityand effectiveness of Performance Management System in their organization. Mr. Kaura talked about the various challenges in PMS, particularly the element of subjectivity or managerial judgement involved in performance appraisal. He shared the best practices in this area and discussed about Formal Appeal Process that is followed by CRISIL in order to address any grievances related to Performance Appraisal. Mr. Raghu Pant elaborated the process of Continuous Performance Management and the importance of aligning it with business. He said that Performance Management is going to be very dynamic in future. It will be aimed at building right set of behaviours, coaching and mentoring than just measuring performance of employees. Both the speakers concluded the session with a brief summary where they said that Performance Management System has to be developed and customised according to the organizational needs. If the system is followed with Discipline, Rigour, Transparency and Consistency, it will be a success. The session was very insightful and appreciated by all the participants. Apart from the faculty members, the webinar was also attended by students of MBA First Year, for whom it was an eye opening experience. 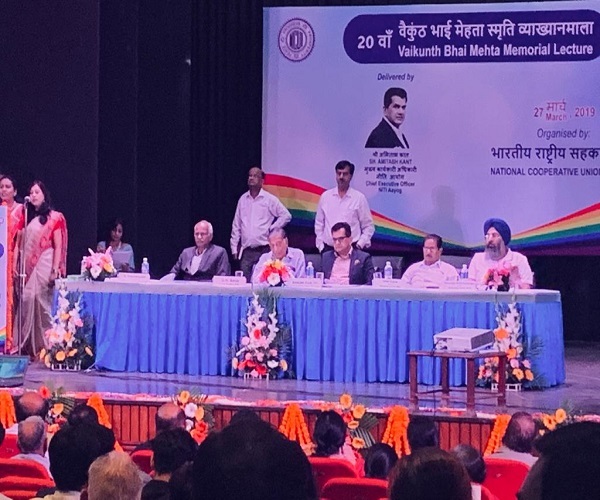 A visit to National Co-Operative Union of India, New Delhi to attend the 20th Vaikunthbhai Mehta Memorial Lecture series organized by NCUI on 27th March, 2019. 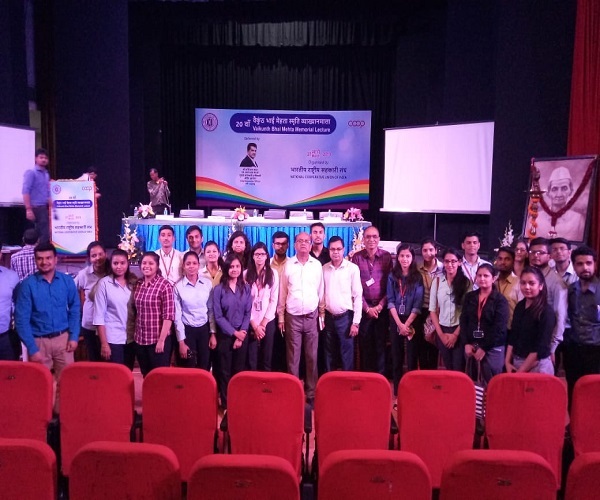 Dr Rajeev Johari and Dr Sanjeev Tandon, along with 44 students of the Department of Management (MBA & PGDM) attended the session. The program started with the lamp lighting ceremony by the Chief Guest Mr Amitabh Kant (CEO, NITI Ayog) and other dignitaries on the dais. Mr Amin (Chairman- NCUI) delivered the welcome address. A brief description about the program and the efforts of Mr Vaikunth Bhai Mehta was given by the Mr Satyanarayan (CEO- NCUI). The much awaited deliberation of Mr. Amitabh Kant, CEO, NITI Ayog was highly enriching. He talked about the importance of co-operatives and also the role of technology in the overall development of the farming activities. He also talked about the fact that involving in the allied co-operative services of fisheries and horticulture can enhance the overall productivity. Proper administration of cooperatives can improve the income level of the farmers. He also gave an example from his own life, where he could increase the income from 12% to 20% by introducing proper co-operative marketing strategies. He concluded his lecture by highlighting the importance of co-operatives unions and their collaborative working with the farmers. The benefits drawn are for the union and the villagers at large. The event came to an end with the vote of thanks by one of the members of the organization who was representing the state of Madhya Pradesh. It was highlighted that Business analytics involved communicating results of data analysis through statistical operations, formation of predictive models, and application of optimization techniques. In layman’s terms, business analytics breaks down information related to past performance to plan for the future. The task of pouring over large amounts of data, or Big Data as it is called to come up with solutions is a profession that reaches even into the most humble parts of daily life. 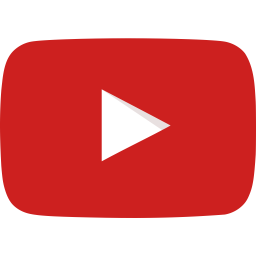 In fact, this particular aspect of business is extremely important to the economy, but more significantly, is attractive to those wanting to take part in shaping some of the most well-known and popular businesses and products. Importance of machine learning was discussed with the examples for better understanding of students. He had discussed the role of analytics in healthcare sector for companies and customers. It was a great learning experience to all participants and students had many queries related to analytics which were resolved intelligently by speaker. 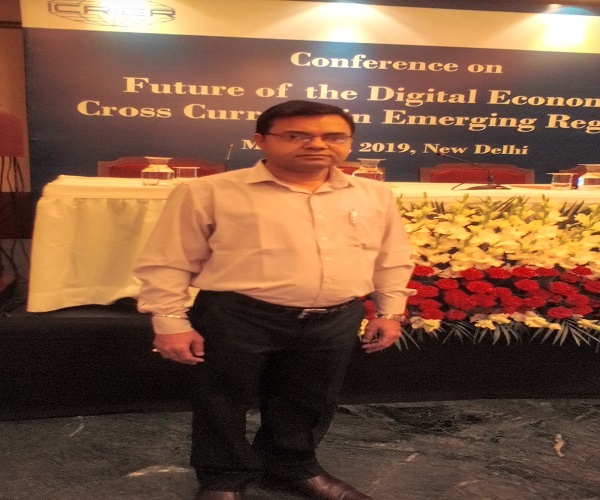 Faculty of Department of Management at I.T.S Ghaziabad, Dr. Rajeev Johari attended the conference on 25th March 2019 at India Habitat Centre titled Future of the Digital Economy: Cross Currents in Emerging regimes. 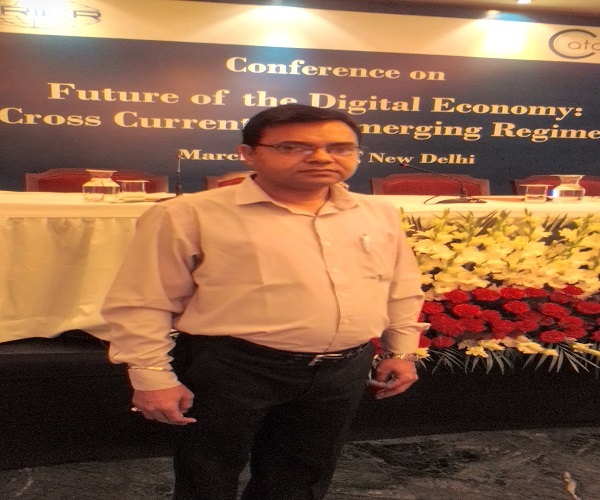 The conference begin with opening remarks by Dr. Rajat Kathuria, Director and CE, ICRIER who highlighted the specific concerns of digital economy in terms of future prospects be it positive or negative and to what extent could it be considered reliable for security and protectionism within government policy framework. Mr. Peter Cherukuri, Executive Director, Data Catalyst Institute delivered his address on data analytics and future course of action in the digitalization of economic growth. The conference was organized with the partnership between ICRIER and Data Catalyst Institute. Key Note Address was delivered by Ms. Aruna Sundarajan, Secretary, Department of Telecommunication, Govt. of India on policy issues and vertical impact on qualitative data which also highlighted the digital instrumentation for younger demography and e-commerce. She interlinked data with the security of incremental growth and digital drivers. The conference was structured in three panels and every panel was based on different areas viz. Future of the Digital Economy, Data Security: Emerging Discourse on Encryption and Localization and Identity and Authentication in India’s Digital Economy. Panelist and Moderators were experts from academia, industry, technocrats, service providers, info analysis from public, private and Government institution and Ministries. The discussion centered on data security, privacy security, data space, data user’s identity, quality of data, data storage facility, digital technology and interlinking with growth and delivery of services etc. A special address by Mr. Gopalakrishnan S., Joint Secretary, Ministry of Electronics and Information Technology, Govt. of India was delivered on the issue of privacy and data storage facility focusing on spectrum supply by Government. Overall it was a great learning experience with new insights gathered on a wide array of the specified theme.